Materials: True Friend stamp set, Creamy Caramel card stock & ink, Rose Red & Old Olive markers & card stock, Old Olive grosgrain ribbon, brads and staples. This next one used the Pocket Silhouettes set. 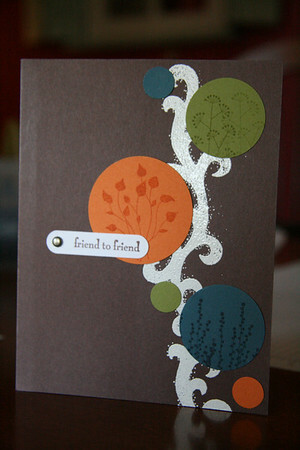 Materials: Chocolate Chip, Pumpkin Pie, Not Quite Navy, and Old Olive card stock and ink. Winter White embossing powder, VersaMark pad, heat gun (I used a baroque style stamp that I had, it's not SU, don't tell). Using the 1 3/4", 1 3/8", 1 1/4", 1/2" circle punches along with the word window punch made a fast but strong impact on this simple card. Very quick, love that. The last one is my favorite. Maybe I have a Tippi Hedron complex, but I'm very in to birds lately, but nice, cute birds only please. 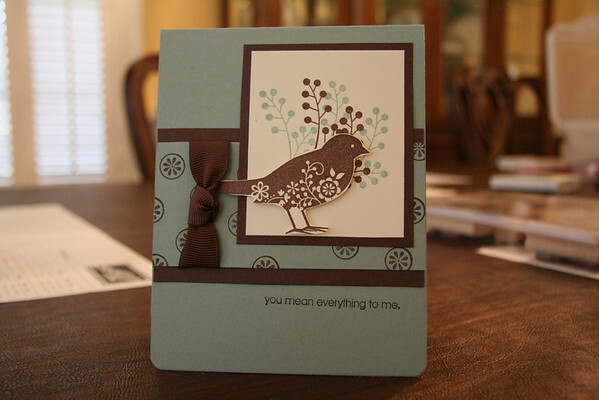 Materials: Always stamp set, Sage Shadow, Chocolate Chip card stock & ink, Very Vanilla card stock, Chocolate Chip 5/8" grosgrain ribbon, corner rounder punch. Cute cards. Funny to read the names of the cs. Some of them have changed since I worked there!! I was SO SAD I couldn't come play. Hopefully we can work sick bosses in around my play dates! Your cards look cute and I am STILL borrowing the ideas from the website. Thanks for posting! I know, some of their color names crack me up. I seem to be very partial to Chocolate Chip...could it be because it's named after one of my favorite things? Way too much fun. I wonder if I would be messy doing this? OH YES. But, you make it look so easy and I know it's not! Ohh those are so cute.. I always think I'm creative, but then I can't figure out what to do when I sit down with supplies! you've got some serious talent! i love those! i wish i were patient enough to try it out myself! 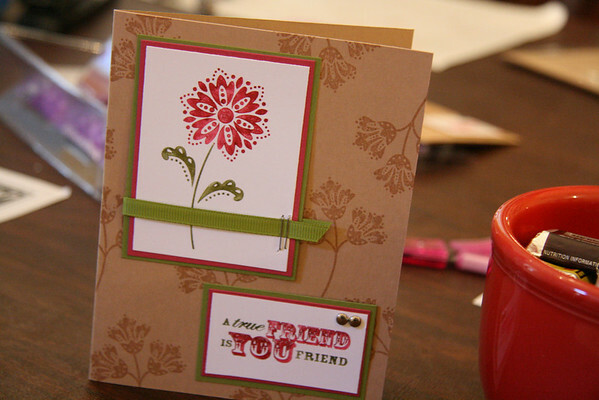 How delightful to get together with friends for a day of creativity, your cards turned out great! I have serious card envy! So much eye candy on your blog lately..love it!